Looking back on a culinary history is a very interesting hobby for me. I love it. Living in Spain, there is a strong influence of the Romans. I was looking into this more deeply recently and discovered that many recipes fro that period survive until this day. Can you believe that? 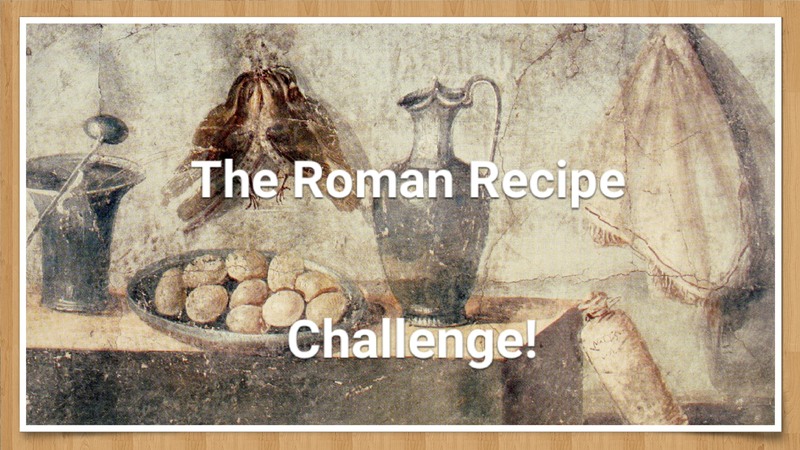 I decided to have a Roman Recipe Challenge and as I read more about the Romans and food, I discovered several things. Pompeii, a cosmopolitan city not far from Naples that was preserved by the eruption of a volcano called Mount Vesuvius, has remains of fast food counters. They looked like this! The second image is from a fresco on a wall in Pompeii. This is a tradition that has continued in Spain. There is never just one dish. You start with a salad or light appetizer, your main meal and for dessert you can have something as simple as fruit. The Spanish word for ¨to have dinner¨is ¨cenar¨and cena also means dinner. I was also surprised by the fact that the clay dishes found in Pompeii had very little differences to the ones used in Spain now. Ok, many restaurants will use fancier dishes but if you go to a tapas bar Andalucia or to a restaurant in Segovia, you will see the clay dishes. They are great and really help to keep your food warm. A lovely soup served in a traditional bowl while visiting Segovia two weeks ago. There were more things that I learned but that is for another post. Now I present to you my Roman Culinary Challenge recipes. The first two recipes I could not share because i did not have permission, but ihave provided the links. I am looking forward to seeing what the other lovely participants have made! I should thank them now for joining me. I hope that you have enjoyed this as much as I have. This was lovely. It combined such lovely ingredients such as leek, mint, vinegar, parsley and feta cheese. You can´t go wrong with this. I was quite surprised by the amount of mint but you know, you can adapt this the way you would like. For the recipe, check here . It went beautifully with the burger and I would make it again! Now this was interesting. A burger with pine nuts and wine? Well…why not? Ok, I poured myself a glass and then got to wotk making these. Ah that makes me think of Julia. Her words of wisdom. These were easy to make and delicious. I did not use any buns because I just didn´t think it was necessary.On a side note, I have this marvelous gadget that enables me to make great burger patties. Just put a light coating of sunflower oil inside so the patty doesn´t stick an you are all set.Some gadgets are a waste. This is not! I found this recipe here . A little Caroneum * Caroneum is white wine boiled down to half of its original amount. I think I used about a cup of white wine and boioled itdown to half a cup. I drizzled it over the burgers as I fried them. Mix the ground beef with the bread that has been soaked in the wine. Make your burger patties and place the pine nuts into them. Serve in buns or without! The Pine Nut Tart -Ready for dessert! This tart was wonderful. Just wonderful. The recipe for this suggested a mixture of nuts but I just used pine nuts. I substituted the amount of other nuts with the pine nuts. Next time, I will try it with walnuts too. It also required sheep´s milk but I used regular cow´s milk instead. As for the dessert wine, I used a sweet sherry. This was very easy to make too. My husband loved it so much that he poured me a glass of sherry to accompany my slice! I would definitely make this again! Want the recipe? It is here ! The recipe says to pour a bit of boiled honey on top but I didn´t do that. I was happy the way it was. This challenge has been a lot of fun fore and I hopethe other participants feel the same way! I am looking forward to seeing what they have done and thank them in advance for joining me. Wow ! so interesting !!! Seems like the Romans certainly knew their stuff. The burger with wine, fascinating ! The salad, yum. The dessert must have been amazing, but then again I love nuts ! Wow that must have cost a fortune for the pine nuts. At least in the States they are very expensive. But that pine nut tart looks absolutely amazing! You did fantastic with this challenge! I thought the same thing.Pine nuts are soo expensive. Ha ha 🙂 I think they’re like 8euros for 100g. They are VERY expensive in the States. In Italy, you can just gather them from the ground! Oh wow, that’s pretty cool to know, thanks! 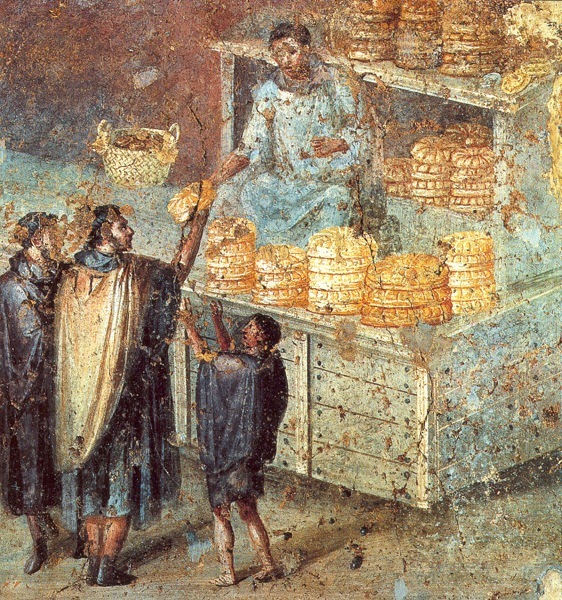 Now I want to have a Roman dinner party. Do you think grilling or broiling the burgers would lessen the Roman-ness of them? Wow Natascha they all sound very good and definitely the burger is worth a try and I am not a burger girl …..but it was the wine…I confess and have reblogged. I chuckled at the recipe for roast boar “you need a very large oven or a small boar”. Everything on your Roman menu looks delicious Natascha!! I’ve linked my Roman Eggs – can’t wait to see what everyone else is doing! 🙂 Thanks for hosting! Oh cool! Thank you so much. Like you, I learned new things and tasted different flavours! I had a ball! Thank you for participating. I will have to try these!! This was so interesting. I would like to try in the future (after I sell my house and settle into a new, smaller home – fingers crossed). My dad is Romano – which means he is from Rome, Italy which is quite different than roman. He never cooks like this, but living in the states we could not always get our hands on ingredients and only could listen to my dad’s descriptions of the markets and food in Rome. Also, I believe Italian cuisine changed dramatically in the 16 & 17th century with the introduction of tomatoes from the new world. These recipes, except for the pignole pie, seem closer to greek cuisine. My husband is cypriot and they use loads of mint on everything, while greeks use more dill and feta. The burger is sort of similar to keftedes which is a greek hybrid burger/meatball.